It’s been a long time coming but finally, yesterday, I received the news that Running from Shadows has hit the presses! Many viewers of the original blog which charted my journey to the finish line of the Marathon des Sables in 2012 commented “Great blog! What about a book?” (thank you all! ), particularly as there’s little to read about competitors’ actual experiences of the Marathon des Sables itself. So the next project, after the blog, was to produce a book. After 18 months or so of piecing together lots of memories, notes and research Running from Shadows went to the publishers and now I’m delighted to say its gone into print, available to purchase from mid-March 2014 in both paperback and e-book. The book explains why I was motivated to enter the Marathon des Sables and explains how I went from a 16-stone unfit former mid- to back-of-the-pack runner to finally crossing the finish line of that event in April 2012. Much of the book recounts my experiences of each stage of the race and ends with my returning to the UK with a new perspective on what I wanted to do. The book contains lots of helpful tips with appendices detailing the kit I carried, weights, food and calories taken. 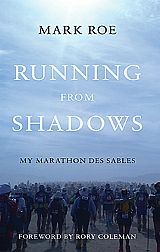 With a Foreword by highly-regarded ultra-running performance coach Rory Coleman, himself a multiple times finisher of the MdS, the book is both entertaining and informative for those who have run or aspire to compete in the Marathon des Sables as well those who would never consider it but wonder what all the fuss is about! I hope you enjoy reading it as much as I did putting it together.